Jess Clayton Rose age 89 born 2-20-1922 our music vocal passed away October 5, 2009. Jess Rose did live in Texas. He appreciated being invited to our 50th reunion but due to health reasons could not travel to Kansas. Thank you Mr. Rose for being our vocal teacher. We have entered a vocal tribute played on our class web site..
We are so glad to report that John Tomlinson our teacher at Shawnee Mission North has been located. Jack Makepeace, Beth Randall, Carol Sundell, Pat Wade, Lauren States, and I will remember Jim especially for what I now recognize as raw courage: he and his wife Eve took us on a trip to Mexico--six teenagers in two cars! Jim and Eve drove one car, and Pat Wade's mother drove another. We traveled down I-35 which was under construction in the late '50's. In Waco where we stopped after the first day of travel, I remember sitting on the steps at the motel looking at a yellow sky. I had never seen the sky that color before--I figured it must be a Texas thing. That's just one of many memories I have of that trip, which I now see as a gift from Jim, Eve and Mrs. Wade who shepherded us through Mexico City, Tasco, Tampico, and back to KC. One time in art class I was having trouble getting started on a project, and I asked him, "How do artists get ideas?" He answered, "Work breeds work." I've always remembered that and passed it along to my own students. He was a fine teacher, and we were lucky to be in his classes at Shawnee Mission. 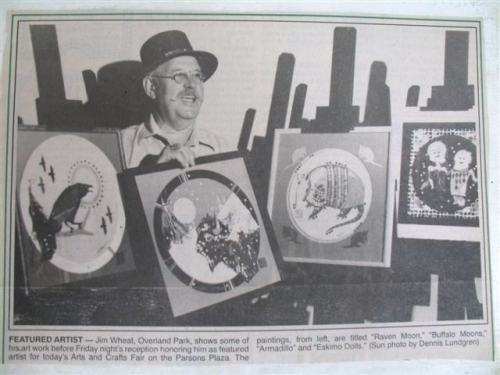 Jim lost his wife in 1990, and he died in November of 2006. 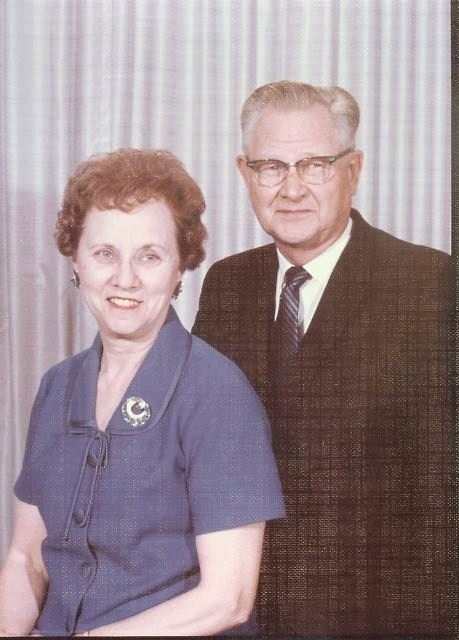 Connie George Elting has recently shared some information on her Dad. "After Dad retired from teaching he was very involved in the library. 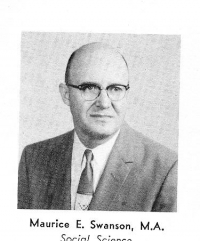 He was also Treasurer of the Johnson County Teachers Credit Union - he and Mother and I think 3 other faculty members started it in the late 40's. He also was involved in Sr. Citizen tax preparation every Spring. He kept very busy until he ended up in the hospital in March of 1984. He died of congestive heart failure." Connie shares about her younger sister "Jeanne Crawford and her husband Hal live in Dayton, Ohio, where he retired from the Air Force . He is working as a civilian at Wright Patterson Air Force base. Jeanne has been a Mary Kay Consultant for years and keeps busy with her 3 grandsons and 2 granddaughters." Warren Connie's older brother "is the Interim Dean of the Cincinnati Conservatory of Music, University of Cincinnati. He will be 72 in a couple of weeks - plans to retire after this year, we'll see. He has 3 sons and 4 grandsons. His wife, Jan, is a retired music teacher and plays in the Dayton Symphony. " "Dad & Mom were always very supportive of our musical wants and needs. Dad was very quiet about his teaching and playing - he never bragged about his accomplishments - it was all about the students. After he retired he became involved with church activities (Country Club Christian), Sertoma, Jo. Co. Library (Mom and Dad commissioned a painting for the Kansas Room), volunteer tax preparation and the Jo Co Teachers Credit Union. Mom and Dad were part of the group that started the Credit Union. I think Dale Pigg and Pop Snodgrass and their wifes and one other couple went in together on it. Mom taught P.E. 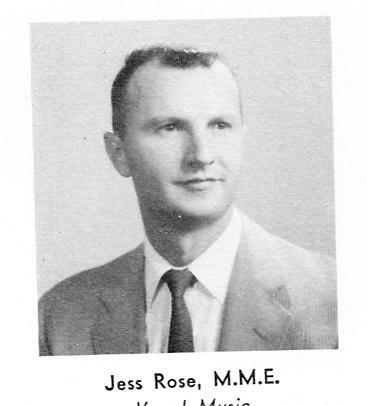 at Roesland Grade school, at SouthWest High School for a couple of years, then finished up at Kansas State School for the Blind (9 or 10 years). 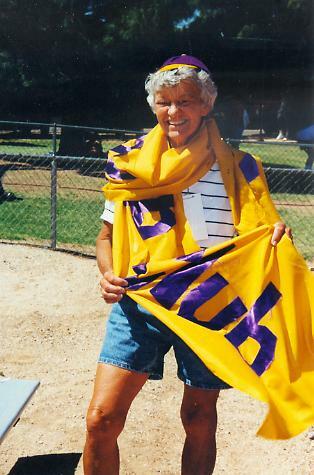 She taught P.E., Travel Training and Home Ec. Thanks Connie for sharing above with all of us! I personally know that he made a difference in both my husband's (John) and my (Peggy Willis Sherard) life. Lonnie Eye Proctor gym teacher Hickory Grove Group of students several years ago went to cheer her on at Senior Olympics. She won silver in the shot put She is wearing a Hickory Grove beanie and the banner was made by Waverly Anderson. She and her husband came to our recent Hickory reunion We thank you for coming!! A question before I attempt to answer yours - I noticed your middle or maiden name is Willis. 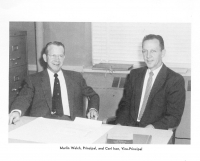 Are you perhaps related to Harold Willis? 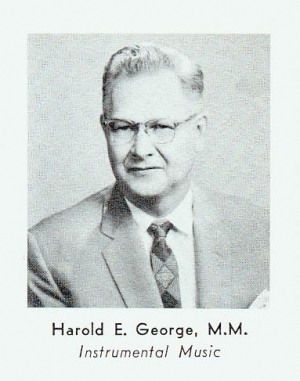 Harold was one of my most outstanding students at S-M-N. The last I heard of Harold was that he was on the faculty of a college in Wisconsin. 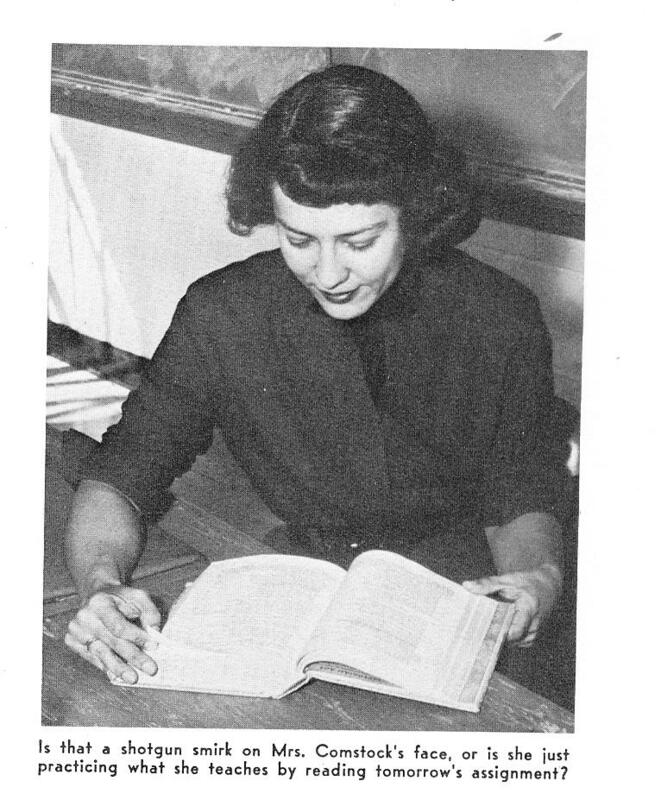 I left S-M after 7 years to join the biology faculty at Emporia State University in the fall of 1960. I spent summers at Drake Univ. Marine Station and the Univ. of Minnesota Freshwater Biology Station while teaching zoology classes at E.S.U. during the academic year. 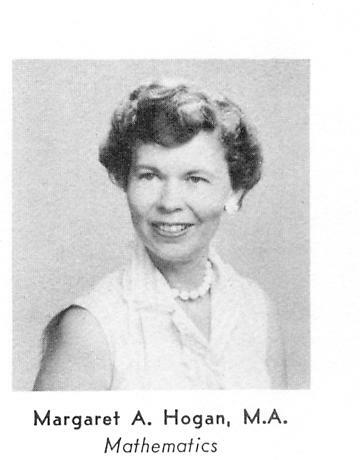 In 1963 I took a leave of absence to work on and complete a Ph.D in zology at Oklahoma State Univ. After returning to E.S.U. 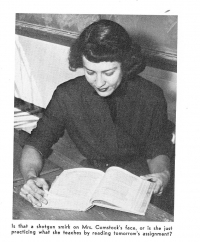 I continued to teach zoology courses and work with graduate students pursuing the M.S. degree. Most of our research was in the field of mammalogy. I retired from E.S.U. at the end of the 1988-89 school year. Since then I live on a few acres west of Emporia, raise a few beef cattle, do a lot of reading and contribute little to the overall welfare of humanity. My wife Martha died in 2006 so I live alone but have sons and grandchildren nearby to keep me company at times. I often reflect on my years at S-M and wonder about those on the faculty at the time. I'm sorry that I can't attend the Sept 21st reunion. Some health problems plus a prohibition to night driving are reasons. Please give my regards to any of the old timers that attend. Thank you for informing me ofthe event. One of our classmates wrote the below but unfortunately we have lost who wrote this. If you are the one please let us know so we can add your name. Maury Swanson changed my life. He recognized me as a shy child with an unhappy home life, and a need for encouragement. Through three years of debating and for the rest of his life, he and his wife, Ila, were like second parents to me, keeping in close contact, visiting me all over the country, always encouraging me. The skills I learned from "Chrome dome" made it possible for me to have a successful career in sales, and the nurturing from the Swansons was priceless. Bless them wherever they are. 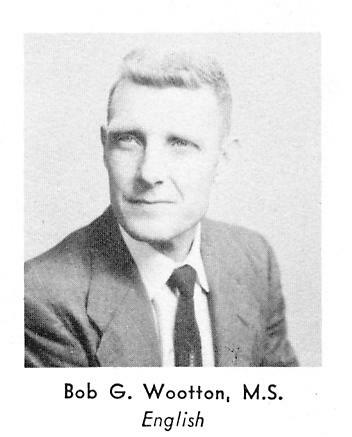 Mr. Boone (Gilbert M. Boone) M.S. Dec. 18, 2007 Steve I located Mr. Gilbert M Boone right here in Kansas City. He said he has no computer but would be glad for a letter or phone call. Address 2410 W. 71st Terr. Prairie Village, Kansas 66208 phone 913-384-1025 I told him we were sorry that we didn't locate him before our reunion as we would have loved to have had him join us at our Sept. reunion. Karen Clayton Taylor says Becky Comstock was her favorite teacher. We were so glad to have Margaret Hogan with us Friday night at our 50th High School Reunion. She lives right here in Kansas City and so many I have spoken to really enjoyed talking to her. Thank you so much for coming! 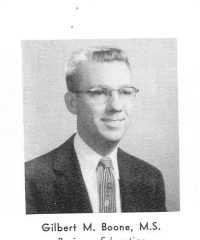 The one who I would love to know about and hear from if still living, is Mr. MCoy, 8th grade Prairie Village teacher. He was so kind, relaxed and caring of a person. It was enjoyable being in his class. And with him being that kind of person; and yet my esteemed teacher, he instilled in me the desire to enjoy working harder at my studies. He was my favorite teacher of all my years while living in SM district, which began in 6th grade.